The Nikon D3 is noteworthy because it's Nikon's first digital SLR camera with a full-frame sensor, but it's remarkable for the amazing speed it delivers in a full-frame body. Not only is the Nikon D3 the fastest full-frame DSLR, but it's the fastest digital SLR camera of any type, with a top continuous shooting speed of 11 frames/second, just edging the Canon EOS-1D Mark III for that honor. That said though, there's no free lunch, and you have to give up something to reach the highest speeds the Nikon D3 is capable of, including full-frame capability at the very highest frame rate. To understand, let's take a look at the D3's performance in different configurations and with different settings. At 10 frames/second, the camera locks the exposure before the first shot, so the exposure will not track any changes in scene brightness that might occur. This won't likely be a problem for short bursts, but could be an issue if you're following a fast-moving subject that transitions from sun to shade or vice versa. Only in its 5.1 megapixel cropped-frame "DX" mode can the D3 hit its all-out maximum frame rate of 11 frames per second, but at that rate it also locks both focus and exposure before the first frame. That these restrictions result from the shooting speed, not the DX cropping mode. At rates below 10 fps, you'll get full performance in any exposure mode with DX cropping active. So, while the Nikon D3 is the fastest digital SLR on the planet, it has to cut a few corners to get there. Fully functional at 9 frames per second though, it's only 10 percent slower than the fastest sub-frame camera, and fully 80 percent faster than the next closest full-frame model, the just-announced, 21.1 megapixel Canon EOS-1Ds Mark III. A more robust shutter. In keeping with its greatly increased speed, the Nikon D3's shutter unit has also been upgraded for greater reliability. Several components that had previously been made of Kevlar are now fabricated with carbon fiber to reduce moving mass and increase rigidity and longevity. Speed isn't only about continuous shooting, though: shutter response and mirror blackout are also critical parameters. Happily, the Nikon D3 really shines in both these areas as well, with the fastest shutter response of any Nikon digital SLR camera to date, a scant 37 milliseconds. 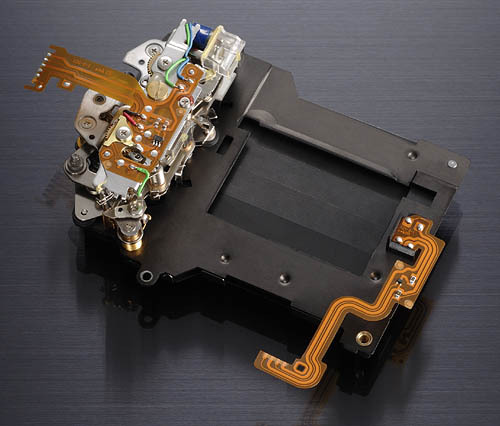 Viewfinder blackout is also very brief, at only 74 milliseconds, thanks to a new active mirror-damping system. Credit for both the increased shooting speed and reduced mirror blackout goes to the all-new shutter mechanism in the D3, which has also been upgraded for significantly greater reliability: The new shutter mechanism is now rated for 300,000 cycles, up from the 150,000 cycle rating of the shutter in the D2Xs. A fast camera is no good without a fast memory subsystem to keep up with it. Both the Nikon D3 and D300 support the new generation of UDMA CompactFlash cards, which offer the highest throughput. 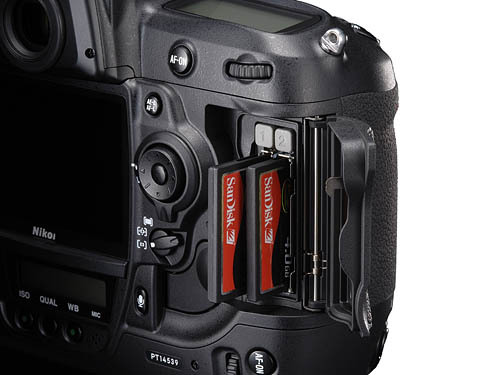 Also, where competitor Canon went with a split-type CompactFlash/SD card arrangement in their EOS-1D Mark III, Nikon chose to give the D3 dual CF card slots. At the press briefing, the Nikon engineers said that the reason for this choice was to insure that there'd be no performance limitation, regardless of which card slot was in use. This makes a lot of sense to us, after using the EOS 1D Mark III with both CF and SD cards: Seemingly any use of the SD card greatly slows buffer clearing, even if we only use it for storing JPEG files in RAW + JPEG mode. We like the flexibility the dual cards offer, particularly the "backup" mode, where data is written to both memory cards simultaneously. This means that the failure of a single card can't wipe out hundreds or thousands of shots, a particularly important consideration with card sizes hitting 16GB, and no end in sight. Excellent speed for a pro SLR these days, all the more impressive for a full-frame one. *Note: Buffer clearing times measured with a Kingston 266x Ultimate CompactFlash card. Slower cards will produce correspondingly slower clearing times. Slow cards may also limit length of bursts in continuous mode. ISO sensitivity and noise reduction settings can also affect cycle times and burst mode performance. Startup time is average for an pro SLR. Buffer clearing time depends on the image size and quality, burst length and the speed of memory card used. Mode switching is quite fast, difficult to measure. Time from fully pressing shutter button to image capture using optical viewfinder, with Nikkor 24-70mm f/2.8G ED lens at full wide angle. Time from fully pressing shutter button to image capture using optical viewfinder, with Nikkor 24-70mm f/2.8G ED lens at full telephoto. Time from fully pressing shutter button to image capture, using Live View "Hand-Held" (phase-detect) mode. When using Live View "Tripod" (contrast-detect) mode, autofocus is performed using the AF-On button. Time to capture, after half-pressing and holding shutter button, using Live View Hand-Held (phase-detect) mode. Time from fully pressing shutter button to image capture, using Live View "Tripod" (contrast-detect) mode. Autofocus is performed using the AF-On button, and is not included in this number. In terms of the D3's ability to determine that it's properly focused when shooting the same target multiple times (with no between iterations, to remove the impact of lens AF speed), its speed is about typical of a professional model, but this is very fast compared to prosumer and consumer models. The D3 required only 85 millisecond for full AF at wide angle and 88 milliseconds at telephoto setting. When prefocused, in release priority continuous mode or manually focused, shutter lag was even faster, at only 43, 49 and 47 milliseconds respectively. The D3's two Live View modes add considerable delay, but the "Hand-Held" mode is faster than some other implementations we've tested recently. The "Hand-Held" mode which uses the same "mirror-down" phase difference AF method employed when using the optical viewfinder has full AF shutter lag of 0.44 seconds, roughly five times the optical viewfinder lag. The "Tripod" Live View mode lag was about the same, at 0.447 seconds, but focusing is performed separately using the AF-On button, so focusing time is not included in that figure. It's easy to see why Nikon chose to call this "Tripod" mode: It's really only going to be useful for still-life subjects, with the camera pretty immobile. The time it takes to achieve focus depends heavily on how far the lens elements have to travel, but even when it's simply refocusing on a previously-acquired subject, it takes about 1.2 seconds with a fast-operating lens. When a slower lens has to rack from infinity to close focus, the AF time in Tripod mode can easily stretch to 3 seconds or more. Once prefocused, "Hand-Held" mode shutter lag is a very fast 45 milliseconds. Depending on the lens in use though, it can take a long time to find focus, if the optics have to move a significant distance. Time per shot, averaged over 30 shots. Time per shot, averaged over 20 shots, or buffer depth, whichever came first. Time per shot, averaged over 21 shots. Time per shot, averaged over 17 shots. Time per shot, averaged over 16 shots. Time per shot, averaged over 15 shots. 45 seconds to clear* Time per shot, averaged over 15 shots. Continuous mode is very fast when in any mode including 14-bit uncompressed RAW, at just over 9 frames per second. Unlike the D300, the D3 did not slow down at all when shooting 14-bit vs 12-bit RAW files. Buffer depth in large/fine JPEG mode was 30 frames, and varied between 15 and 17 frames in RAW mode, depending on what bit depth and compression was used for the NEF files. For really blazing speed with the D3, you can shoot in "DX" mode, where the sensor area is cropped to match the "DX" size sensors in Nikon's sub-frame DSLRs. In this mode, the D3 easily met the 11 frame/second spec that Nikon gives it. This drops the resolution down to 2,784 x 1,848 (5.1 megapixels), but that's still a very usable resolution level, and the speed in this mode is unparalleled. JPEG buffer depth shooting "normal" subjects is likely to be a good bit greater than we measure with our deliberately difficult-to-compress test target, so your mileage (buffer capacity) may vary, but should generally be better than our measurements. With the very difficult-to-compress target we use for measuring buffer capacity, lossy and lossless RAW compression increased the buffer depth by just one over uncompressed in 12-bit node, so best to choose lossless compressed. Compression mode didn't seen to impact buffer depth in 14-bit mode at all. 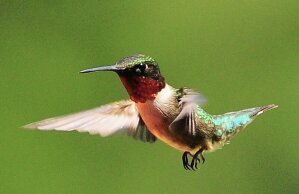 Like other recent pro-level SLRs, the Nikon D3 makes good use of very fast memory cards. We don't have specific numbers to publish here, but did note that slower cards definitely led to longer buffer-clearing times. Outstanding battery life for an SLR lithium-ion design. The table above shows the number of shots the camera is capable of on fully-charged battery, based on CIPA battery-life and/or manufacturer standard test conditions.